Street Technology Experiments (STX) is a brand that merges fashion and technology, to deliver exciting and innovative new street wear. STX is a fully patented, drawstring earbud (“lacephone”) concept that will be released through one of the most globally worn items of clothing - THE HOODIE. 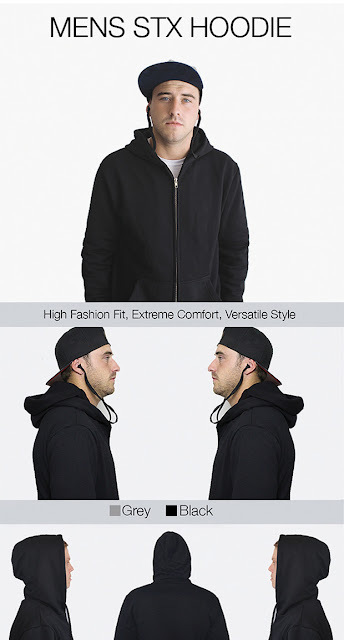 Specifically designed to seamlessly connect to any smartphone device through a set of cables, ear bud lacephones and hidden channels within the Hoodie lining, for ease of use. STX solves the universal problem of smartphone users having to constantly untangle earphones - by converting the hoodie laces into powerful new “lacephones” that allows users to listen to music on their device, as well as take phone calls without having to hold the smartphone which is safely hidden but easily accessible within a pouch in the STX Hoodie. The STX Hoodie is a garment made from the highest quality 320gsm, 100% cotton, beautifully detailed stitching, heavy duty zippers and top quality “lacephones” in a premium “on the go” fashion item for men and women. The STX Hoodie will be launched exclusively on the Crowd Funding platform Indiegogo on Monday 18th January 2016, enabling forward thinking tech savvy and fashion conscious consumers from around the world to support and enjoy the product first.There is currently nothing like the STX Hoodie available on the Indiegogo platform and the elegant simplicity of the product is expected to resonate with fans of crowd funded products. STX is a brand that is powered by Headtrax Technologies, the team behind Snaptrax (www.snaptrax.co), a safe, wearable Bluetooth communication device. Headtrax Technologies is a privately held Australian Company based in Sydney that is focused on developing products that deliver the latest in safe, wearable technology, combined with appealing design aesthetics for fashion conscious consumers, as well as powerful utility use for professional users.